All automotive work is done in our climate-controlled facility, using only the best films available on the market. Choose from High-Performance and Ceramic tint. Make your home more comfortable and energy efficient with residential tinting by Window Kote, backed with a written life-time warranty. 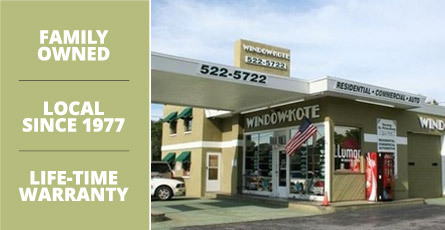 Window Kote is a family-owned business, operating at the same location in St Petersburg, Florida since 1985. At Window Kote, we use only the highest grade window film. Florida’s climate is harsh on window tint, so it is crucial to provide tint that can stand up to our hottest summers. We exclusively use Solar Gard® films from Saint Gobain. All our products and installations are backed by a life-time warranty. We offer a wide range of services, including automotive, residential and commercial tinting, as well as decorative film and graphic applications for vehicles, fleets, and businesses.